Livestock watering tanks will develop a layer of ice in cold weather, and then progress into a solid block of ice if not tended to. The usual solution for this is to use an electric stock tank heater. These are thermostatically controlled heaters that turn on when the stock tank water gets near freezing. The heaters do a good job of preventing ice, but they are terrible power hogs. Typical stock tanks have a large exposed water surface that loses heat by both convection and evaporation. They also have highly conductive single wall sides and bottom that are in direct contact with cold air or cold ground. If you set out to design a tank to maximize heat loss, you could not do much better than a typical galvanized or plastic stock tank -- they are awful. The result is lots of energy consumption, high electric bills, and high CO2 emissions. We measured the electricity consumption of the heater on the old tank during mild winter weather at 8.5 KWH per night -- this is with night lows in the 15F to 30F area, and highs in the 25F to 40F area. I would guess that with "real" winter weather you could see 30 KWH per day -- this will cost $3 a day and generate 45 lbs of CO2 a day. The material below describes the latest version in a series of insulated and solar heated stock watering tanks that require little or no supplemental heat to be free of ice. Complete construction details are included. The table below shows the original prototype and several follow-on designs built by Build It Solar readers. They all work well, and in reviewing them you may find ideas in that will fit your situation. This is the original crude prototype I built just to see if insulation plus solar heating might be effective in reducing ice. 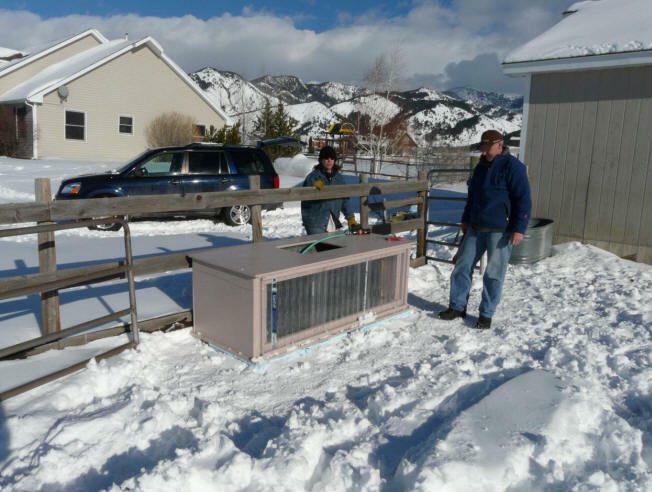 This tank was never tested with actual animals, but several months of cold weather testing showed that insulation plus solar heating is effective in ice reduction. It is a 2X4 and plywood box with rigid insulation board inside, and a waterproof liner inside the insulation board. A glazed solar collector is built into the south wall. The absorber for the collector is the uninsulated south wall of the tank itself. This is the tank that Freedom built that follows pretty much the same design as the prototype with more care in the construction. Freedom reports that the tank is working well, and has been nearly ice free. This is Bob's well insulated Rubbermaid stock tank. It shows that a considerable reduction in heater use can be accomplished by just using good insulation. This is Steven's tank. It uses a galvanized stock tank as the water holding vessel, and builds and insulated box around it using 2 by lumber and OSB. The south wall is glazed, allowing the black painted tank wall to act as an absorber for the collector. This is CS's tank. Like the one above, and our new tank, it uses a galvanized stock tank as the base, and adds an insulated wood box around it. The lid restricts heat loss from the open water surface. CS also included a hog panel wire protection screen in front of the collector glazed area. CS reports only a very thin layer of ice that is easily broken with a finger push after very cold nights. This design is based on the ideas and lessons from the all of the above designs, and from Lori's (my neighbor with horses) ideas on horses and their interesting habits. A lot of people already have these, they are durable and not to expensive, and the metal wall painted black on the outside makes a good solar absorber. They seemed to work out well for Steven and CS in their tanks. I used two layers of the SunTuf polycarbonate glazing for the south wall of the enclosure in front of the absorber. This should about cut the night time heat loss in half, while only cutting the solar gain by about 10%. The rectangular 2X4 framed plywood covered box is easy to build and easy to install insulation in. Lid over tank with horse head size opening for drinking. The lid over the tank helps to cut down the heat loss from the open water. The idea of a floating insulation lid was not tried, as it was thought to be to susceptible to damage. The water surface is still a high heat loss area, and while the partial cover helps, I'm sure that performance could be improved if the top water surface could be better insulated. Any ideas? 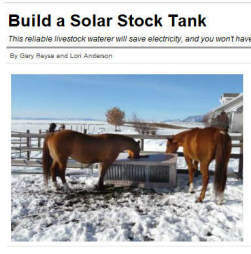 I think that the end result is easy to build, durable, and will handle the ice problem without supplemental heat in all but the most extreme weather. We measured the consumption of the electric heater on the old tank (a bare galvanized tank) during mild winter weather at 8.5 KWH per full day -- this is with night lows in the 15F to 30F area, and highs in the 25F to 40F area. I would guess that with "real" winter weather you would see 30 KWH per day -- this would cost about $3 per day and result in about 50 lbs of CO2 emissions. Lori's experience with the new tank so far is that it is fine with no heater almost all the time. On cold mornings there may be a very light skim layer of ice that is easily broken with a small push from a finger. If you do get this ice in the morning, it usually goes away completely later in the day. There have been a couple of occasions over the full winter when several days of -10F or worse type temperatures required the use of the heater for a couple days. 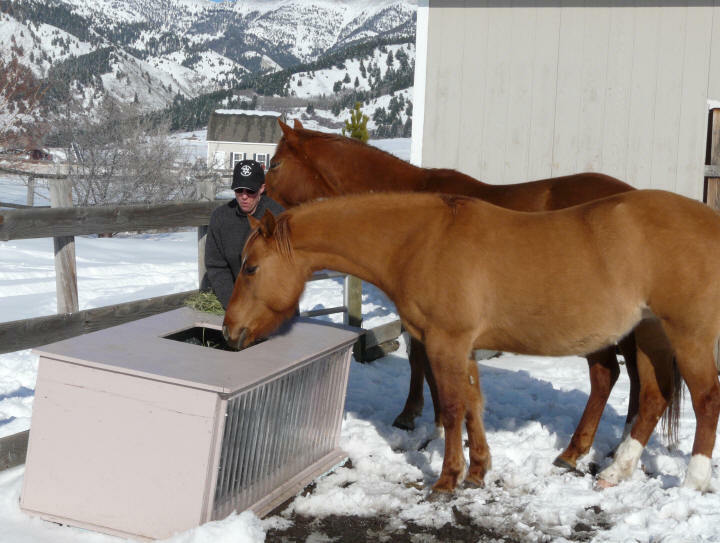 Even in these circumstances, the insulated tank greatly reduces the heaters electricity use. 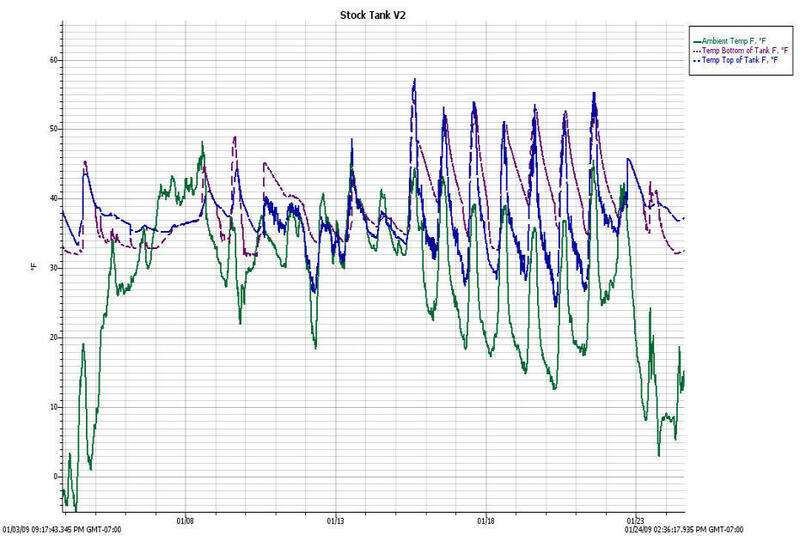 This is a sample plot for a few days showing ambient temperature, and the temperature near the top of tank and near the bottom of tank. The horses seemed to take the new tank in stride with no problems. Lori thought they might have a problem sticking their heads into the fairly small opening, but they took to it with no problems. The pictures just below provide an overview of the tank construction. The box that encloses galvanized stock tank is framed with 2X4's. Cut out and attach the plywood sides and back of the box. The front is left open for the collector glazing. Cut out the top and bottom panels for the tank. The bottom is installed at this time, and the top set aside to be installed as the last step. The top has the hole to allow the horses access to the water. All of the box enclosure parts need to be protected with exterior paint. All the seams should be caulked to reduce air infiltration. The insulation board is cut out and fitted to the bottom and sides of the tank. The two layers of SunTuf polycarbonate glazing are fitted to the front opening of the box. SunTuf is a highly transparent and very tough polycarbonate glazing. Place the galvanized tank in the box. The tank is doing quite well in its current incarnation, but there are always things that might be improved -- here are some candidate design improvements. 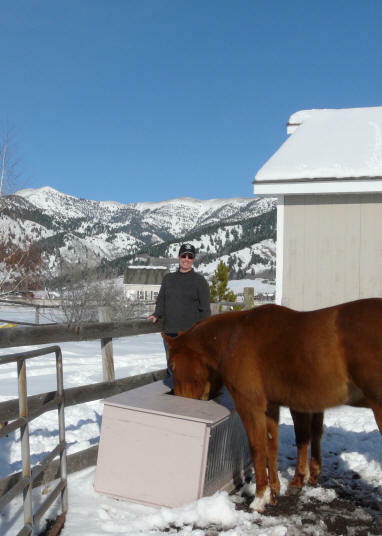 While Lori's horses don't seem to be interested in damaging the SunTuf glazing, and the polycarbonate is pretty tough, you might want to consider protecting the glazing if you think your stock are likely to damage it. The hog panels that CS used on his tank seem like a good way to go. The tank is difficult to drain. I plan to add a drain pipe and valve that goes through an insulated hole in the outer enclosure and connects to the threaded drain plug on the stock tank. A lid design that allowed the tank water surface to be better protected from exposure to cold, and is stock proof would be a good improvement. This is the only major remaining heat loss, and reducing it would probably eliminate the need for any supplemental heat even under extreme conditions. Rachel also reports that she covers the drinking openings at night and then takes the covers off in the morning. This should be a very good reduction in heat loss fromt the drinking hole. The 2 layers of thick foam board insulation on the bottom, sides, and back may be overkill. The R value on the bottom, sides, and back with 4 inches of extruded polystyrene is about R20. The heat loss with an outside temperature of (say) 10F, and a water temperature of 40F is about (42 sqft)(40F - 10F)/ (R20) = 63 BTU/hr or 1500 BTU/day. The 1500 BTU/day heat loss would cool 50 gallons of water by (1500 BTU/day) / ((50 gal)(8.3 lb/gal)(1 BTU/lb-F)) = 4 F a day from heat loss through the bottom and sides. The heat loss through the front out the double glazing is about (10 sqft)(40F - 10F) / (R2) = 150 BTU/hr or 3600 BTU/day -- so the heat loss out the front double glazing is twice that of the heat loss out the back and sides. The heat loss from the top is hard to calculate, but is probably at least as much as the front. This probably argues that the insulation on the back and sides could be cut back some without effecting the performance of the tank a lot. So, if you wanted to cut the budget a bit for building the tank, I think it would still perform quite well with one layer of 2 inch extruded polystyrene all the way around. Be sure that all of the 2X4 frame gets some insulation on the inside -- don't let the 2X4's bridge heat into the box. Another way to save some money on insulation would be to use rigid foam board under the tank but use fiberglass insulation around the sides and back. Note that if the heat loss out the glazing seems like a high price to pay for the solar gain, the gain for just 1 hour of good sun makes up for the heat loss through the glazing for a full day. If you visit the tank location fairly often, the overnight heat loss could be cut drastically by: 1) placing an insulated cover over the drinking opening at night, and 2) placing an insulated cover over the collector glazing at night. This could be done when very very cold nights are anticipated. Even doing just the insulated cover over the drinking opening would probably help quite a bit. Do horses drink at night? If the location for the tank gets little or no sun, then just use insulation all the way around the tank. This should still reduce the ice formation problem significantly. The water has a lot of thermal mass, and has to be cooled from around 50F down to 32F for ice to start forming. If the heat loss rate is reduced by using insulation, it will take some time for the water to cool enough to form significant ice. Note that the tank could be used with an electric stock tank heater in extreme cold weather. The added insulation should greatly reduce the power consumption of the heater. If you think you might want to be able to use an electric heater, then allow for the heater cord in the construction.